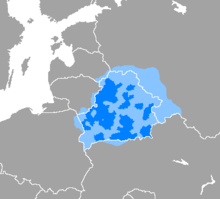 Belarusian ([bɛləˈruːsiən]; беларуская мова belaruskaya mova [bʲelaˈruskaja mova]) is an official language of Belarus, along with Russian, and is spoken abroad, chiefly in Russia, Ukraine, far-eastern Poland and the Vilna Region. In the Belarusian language, which is called Ruthenian and Litvinian-Ruthenian <...> spoken by about ten million people; it is the richest and purest speech, it was a long time and well-designed. Because it [Belarusian language] has enough lightness and strength at the same time, it transmits soft and tender feelings in its poetry. It has easy and accurate expressions in live conversation. The Belarusian language does not have many expressions for uttering things for which our nation has no necessity. But the Belarusian language has deep roots and is able to develop words and expressions that were absent in those roots. Every language experienced an era of childhood. I listen to Belarusian language as music when I walk the streets of Minsk. People who speak Belarusian cannot do anything except talk about it, because it is impossible to express anything great in Belarusian. The Belarusian language is a poor language. There are only two great languages in the world, Russian and English. The pro-imperial dictatorship of Lukashenka promotes the policy of unification with Russia, destroying the national culture and the Belarusian language.